November | 2014 | and a beauty to you! The mincemeat making happened yesterday with Cindy, Ann, and Shelly. When I tasted our mincemeat before heading to bed last night, I said, “this may be the best we’ve ever done.” I could have been swayed a little by Gillian’s exuberant remarks after she tasted it when she came over for dinner last night. The mincemeat is done, so this story is about the Pumpkin Pumpkin pie. In the early days of wellspring, we had a very talented woman, Anne Clarke, who had worked for a restaurant group in Center City Philadelphia. I asked Anne if she had any ideas for turning an ordinary pumpkin pie into something extraordinary and delicious. 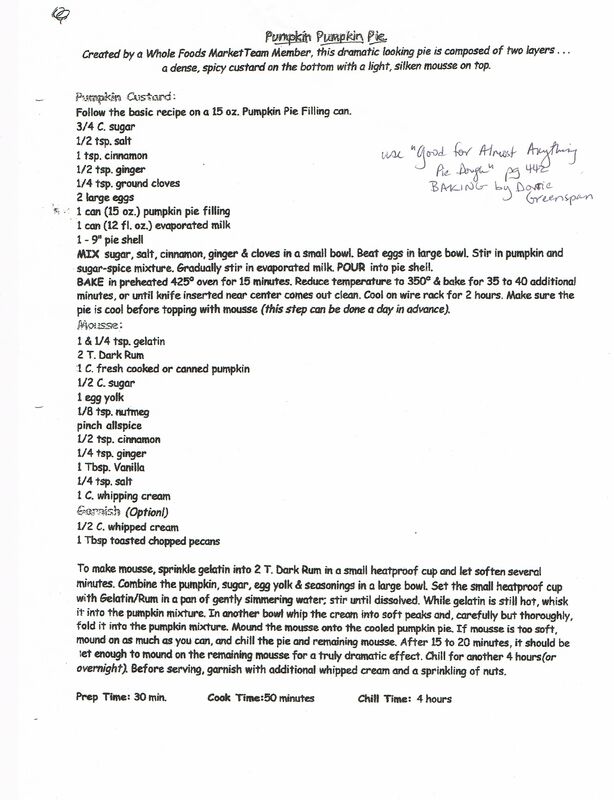 She developed the pumpkin-pumpkin pie, which is a basic pumpkin pie with a pumpkin mousse layer on the top. Pumpkin Pumpkin Pie became legendary in the Wellspring circles. We sold as many as we could make in the days before Thanksgiving. We printed the recipe on our grocery sacks for anyone to make at home. Ann makes this pie every year. Even though I cheer for the mincemeat to gain popularity, this pumpkin-pumpkin is everyone’s favorite. I am thinking about pies. I have two stories. One is about pumpkin pies. One is about the mincemeat making ritual, which will happen this afternoon. I want to be careful about exactly what I say because I was taken to task by my friend Paul, who is from England – he didn’t like the fact that in an earlier story that I credited New Englanders with transforming mincemeat into primarily fruit pies. Check here for what Wiki has to say about the history of mincemeat. I love this ritual of making mincemeat. What I like about it is that it doesn’t have a precise recipe. You have to balance the level of spice and sweetness. Mincemeat gets its name from the word mince, which refers to being finely chopped. The original article wasn’t used in a dessert pie, but rather a meat pie (p-y-e) – today there is often no meat in mincemeat pie at all. Some recipes call for a little bit of beef fat. In my version, I simply use a knob of butter. Even though I assure the children that there is no meat in the mincemeat pie, they opt for the other option – particularly the pumpkin-pumpkin pie, which is another story. The key to good mincemeat is to get the spice and sweetness ratio correct. Every year the recipe is a little different. My friend Cindy is determined to get a recipe documented for people to follow. That has yet to happen. She’s working on it. The main ingredients are apples, slow cooked for hours dried currants and dried cherries. The liquid is apple cider and a skoche (that’s Lex speak for about two ounces) of bourbon (or brandy). The spices in my recipe are cinnamon, allspice, nutmeg, and cloves. I get to use the almost used up jars of jam that are close to crystallizing in the fridge. Orange marmalade and apple butter are particularly good. On our 39th wedding anniversary, I wanted to say more than “I am a lucky guy.” I want to say a little more about my partner of 39 years. I would like to describe something that you might not know about Ann. She has the most unique composite of business skills of anyone I have ever met. A blend of practicality, courage, and stalwartness – a unique bend of those things. A popular exercise amongst sports commentators is to pose the question… and if the sport is football – they ask “which quarterback would you choose to build a team around?” If its basketball it’s about the point guard. If someone posed the question to me, “if you were starting a business and building a team – and you could have anyone to build the business and the team around – who would you pick?” I would pick Ann. Ann has the ability to know and have the courage to say what needs to be said when no one else is going to say it. There are many decisions in a business’s life that are critical to business’ success. I am an idea guy, prone to excess and grandiosity. I need an Ann to reign me in. I probably won’t start another business. I promised myself that I wouldn’t have a restaurant, although I already have a concept. Because I love ideas, I have a well-defined idea if I wanted to. And a beauty to Ann Alexander! I am not sure where childhood memories fit into what I am going to say. There are stories that people in your family tell you about things that you did as a child. I do remember some of the things having to with shoe and my childhood. If someone were to ask me where my love of shoes began, I think I would know what to say. My father had a very cool shoe rack in his closet that held somewhere around 15 pairs of shoes, the heels catching on a little 1×2 piece of wood and the shoes sitting on a shelf at 45 degree angle. I remember playing with those shoes – rearranging them, etc . My father told me that we would play a game. He would say, Lex, bring me the orange shoes. I would try to figure out where they were. The orange shoes were a Scotch grain. They had an orange-ish look. Not chocolate brown. He had nice shoes. Not expensive one’s, but not commodity cheap one’s either. When it came time for me to get a pair of shoes that seemed important to me, he said we’d get the cheap ones from JC Penny, a company that his employer did a lot of business with. So he tried to get me to like it but I never did – “Jaque Pene.” The JC Penney loafers looked cheap and unappealing to me. In fact my dad had a pair of Bass loafers. That’s what I wanted. They were more expensive. I had a little bit of money saved up. The deal we made was that I would pay the difference between the JC Penny price and the Bass loafer price. I ended up with what I wanted. In my 40’s I was often teased about how many pairs of shoes that I had. I felt it was unfair that a woman could have more than me and it would seem normal. I come from a family with a history of aging feet. I have started to have a few of the issues myself. I really miss shopping for and wearing beautiful shoes. On a trip recently, I recalled when having a shoe-shine during my peak “shoe days.” I would talk to the shine man about all the people in the airport wearing tennis shoes. I remember one of the men saying, don’t get me wrong, I like Michael Jordan, but he’s killed the shoe-shine business. I couldn’t get a shoe-shine on this recent trip because I had tennis shoes on, too. Never thought it would come to that, but I was happy to have them on my feet when getting from gate to gate.